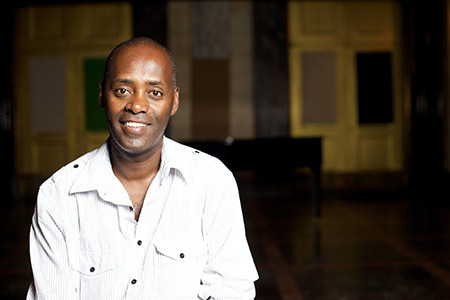 Girma Yifrashewa is Ethiopia’s most famous living pianist and composer. Using traditional tunes as a foundation, Yifrashewa’s compositions combine the ecstasy of Ethiopian harmony with the grandeur of virtuoso piano technique into an effortlessly enjoyable, heady mixture. Born in 1967, Yifrashewa’s life in music began at a tender age with the kirar, a traditional Ethiopian harp. Introduced to piano at age 16 at the Yared School of Music in Addis Ababa, he later studied at the Sofia State Conservatory of Music in Bulgaria with the support of the Ethiopian government. When the fall of the Communist regime in 1989 ended his scholarship, he emigrated to Italy, returning to the Sofia Conservatory in 1991 to earn a Masters in Piano under Professor Atanas Kurtev. In Bulgaria he made an impact as a solo pianist, performing the works of Schumann, Schubert, Chopin, and Debussy until his return to East Africa in 1995. Yifrashewa has chosen to remain in Ethiopia, forging a classical tradition for his own country where classical music is far from a dominant practice. He currently works to promote Ethiopian and classical music, touring throughout Africa, Europe, and beyond. In October 2009 he was invited to Los Angeles for the Africa Meets North America symposium and festival at UCLA. His CD releases include The Shepherd with the Flute (2001), Meleya Keleme (2003) and Elilta (2005). Opening the concert is Seattle composer/pianist Amy Rubin, whose fearlessly eclectic and original music combines the rigorous structure of classical music with the spontaneity of jazz and the complex rhythms of African drumming and Latin American dance styles. She has performed with the Seattle Chamber Players, Seattle Chamber Music Society, Seattle Symphony, and served as a Master Teacher at the Lincoln Center Institute, Oregon Institute for Arts and Education, and Memphis Institute for Arts and Education. As a senior Fulbright Scholar in 1992-93 she lived in Ghana, West Africa, where she was a Professor at the National Academy of Music and the National Institute for Film and Television. She is working on a film about her field research in Ghana, Chasing the African Tale. ← Stuart Dempster & Dennis Rea: Double Tanabata Birthdays!